Survive the onslaught in this intense beat-em-up. 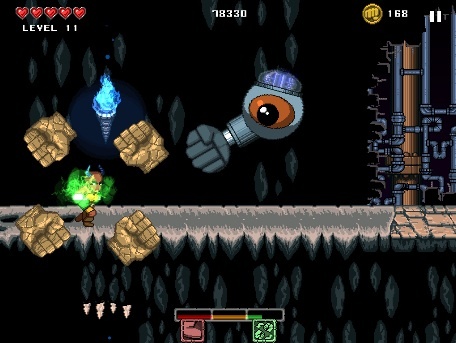 Ask us to name the greatest iOS brawlers, and Rocketcat Games' Punch Quest would undoubtedly make the list. A 2D side-scrolling runner, this intense arcade style beat-em-up pits you against a never-ending stream of bad guys, where rapid punches and super moves are all that stand between victory and the grave. With this in mind, it's easy to get overwhelmed by all those skeletons, ogres and killer bees, which is why we prepared this Punch Quest cheats and tips guide to keep you in the fight. Turns out, you don't have to square off against every baddie you come across. If you're low on health or think you'll be unable to block an attack, tap the uppercut button on the left to jump over a monster, leaving it behind. Better to be alive than dead, we say. The developers behind Punch Quest let you play holding the device horizontally or vertically. Both screen orientations work just fine, but you may prefer one to the other. First, you'll need to purchase the blocking ability from the Upgrades list, and we strongly suggest doing this ASAP. Once you do, simply press both sides of the screen to protect the hero from danger. With this in mind, don't get so punch drunk that you forget to block, or you'll die in a hurry. The longer you play Punch Quest, the more coins you'll acquire. Don't sit on this loot. Instead, pess the Loot button from the main menu, then purchase Power I and Power II skills to imbue the protagonist with special perks. The more you buy, the more you'll unlock. Here's a small list of skills you'll come across. Flyin' Fist: Straight punches or jabs make you fall slower, keeping you in air longer. Ki Blast: Blocking projects a circle of energy from you, reflecting projectiles. Hungry Man: All unlocked food upgrades have a higher than normal chance to spawn. Big Dash: Dashing punches are way faster than normal. Use with caution, or else! Power Slam: Flying slam punches do more damage, thunk enemies hard into shockwave. Deadsplosion: Defeated enemies explode after coming to a rest, damaging other foes. Exploding Fist: Every solid, non-jab punch you do explodes. Shodukin': Non-jab punches call upon the Punch Ancestors for a powerful ranged attack! Knuckle Circle: Giant stone fists circle you, pummeling things while you pummel things! As you run, you'll notice multi-colored torches. Don't leave them alone, as punching torches transforms these objects into projectiles that damage opponents, in addition to offering coins for your trouble. This should go without saying, but if you see a treasure chest, run up to it and mash the punch button to reap the rewards. The same goes for vases and piles of skulls. There's more to worry about than skeletons and ogres. During your travels, keep an eye out for different hazards that'll impede your progress. In particular, spiked floors/walls and flames. If you need more coins (AKA Punchos) in a hurry, an in-app purchase is just what the game doctor ordered. -Punch an egg, causing you to explode into bones, while the egg explodes, revealing you inside the egg, but you're now riding a velociraptor that shoots lasers out of its mouth. -Eat mutagenic food, causing terrifying hallucinations. -Juggle enemies with launching uppercuts and fast jabs, to keep up massive combo streaks. -Slam an enemy into the dungeon floor so hard that it causes a shockwave. -Punch a treasure chest so high into the air it crashes into a bat, both killing the bat and spilling coins everywhere. -Turn into a gnome. Get stung by bees. Explode. -Customize your characters with abilities and devastating Supermoves, and also their appearance in multiple different ways.